The Alexanderplatz demonstration (German: Alexanderplatz-Demonstration) was a demonstration for political reforms and against the government of the German Democratic Republic on Alexanderplatz in East Berlin on 4 November 1989. 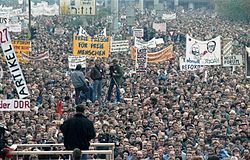 With between half a million and a million protesters it was one of the largest demonstrations in East German history[A] and a milestone of the peaceful revolution that led to the fall of the Berlin Wall and German reunification. The demonstration was organized by actors and employees of theaters in East Berlin. It was the first demonstration in East German history that was organized by private individuals and was permitted to take place by the authorities. The speakers during the demonstration were members of the opposition, representatives of the regime and artists, and included the dissidents Marianne Birthler and Jens Reich, the writer Stefan Heym, the actor Ulrich Mühe, the former head of the East German foreign intelligence service Markus Wolf and Politburo member Günter Schabowski. In early October 1989, East German authorities celebrated the 40th anniversary of the German Democratic Republic. At the same time, they had to face increasing protests across the country and a mass exodus of their citizens to West Germany via Hungary and the West German embassies in Prague and Warsaw. On 18 October, reformist members of the Politburo forced Erich Honecker to resign as the chair of the council of state and general secretary of the Socialist Unity Party (SED). He was replaced by the slightly less hardline Egon Krenz, who became the new party leader and the chair of the council of state a few days later. In his inaugural address, he used the term Die Wende (lit. turnaround) and promised political reforms. He later ordered the cessation of all police actions against protesters and reopened the previously closed border to Czechoslovakia. A few days later, on 23 October, more than 300,000 people joined the Monday demonstration in Leipzig, and many more at other protests throughout the country. When I saw that his hands were trembling because the people were booing I said to Jens Reich: We can go now, now it is all over. The revolution is irreversible." In early 1990 banners of the demonstration were used to decorate and cover the exhibits of the by then politically outdated permanent exhibition "Socialist mother country GDR" at the Deutsches Historisches Museum. In mid-1994 banners and other artifacts of the demonstration were permanently added to the collection of the museum and were shown in an exhibition on the Alexanderplatz demonstration. The banners were preserved by Henning Schaller, stage designer at the Maxim-Gorki-Theater, who asked participants to leave the banners so that they could be collected for an art exhibition. To mark the tenth anniversary in 1999 a series of events under the title "We were the people" (German: Wir waren das Volk) were held in Berlin. B^ : The pamphlet reads: "Information by the association of theater workers. Demonstration against violence and for constitutionally guaranteed rights (Demonstration is officially registered) Time: 4 November 1989 10:00 am. Meeting point: ADN-building (Mollstrasse/Prenzlauer Allee) Banners are welcome." ^ Solsten, Eric (August 1999). Germany: A Country Study. Diane Publishing. pp. 120–124. ISBN 978-0-7881-8179-5. ^ Hancock, M. Donald; Helga A. Welsh (January 1994). German unification: process and outcomes. Westview Press. pp. 78–81. ISBN 978-0-8133-8125-1. ^ a b c d e Timmer, Karsten (January 2000). Vom Aufbruch zum Umbruch: Die Bürgerbewegung in der DDR 1989 (in German). Vandenhoeck & Ruprecht. pp. 276–279. ISBN 978-3-525-35925-9. ^ a b c d e "In guter Verfassung (4. November 1989. Berlin/Alexanderplatz)". DHM-Magazin (in German). Deutsches Historisches Museum. 11: 1–24. Fall 1994. Retrieved 10 November 2009. ^ Heinke, Lothar (3 November 2009). "Das Ende der Angst" (in German). Der Tagesspiegel. Archived from the original on 6 November 2009. Retrieved 10 November 2009. ^ "Bühne der Freiheit". Der Tagesspiegel (in German). 4 November 2009. Archived from the original on 8 November 2009. Retrieved 10 November 2009. ^ a b Kowalczuk, Ilko-Sascha (August 2009). Endspiel: die Revolution von 1989 in der DDR (in German). C.H. Beck. pp. 446–453. ISBN 978-3-406-58357-5. ^ Flierl, Thomas (1999). "Wir waren das Volk" (in German). Bezirksamtes Mitte von Berlin. Retrieved 9 November 2009. ^ Schmemann, Serge (5 November 1989). "500,000 in East Berlin rally for Change". The New York Times. Retrieved 10 November 2009. ^ Schmidt, Helmut (10 November 1989). "Ein Aufstand gegen Zwang und Lüge" (in German). Die Zeit. Archived from the original on 21 October 2008. Retrieved 10 November 2009. ^ Cammann, Alexander (April 2008). "1929–1989. Eine Revolution frisst einen Jahrgang". Magazin der Kulturstiftung des Bundes (in German). Kulturstiftung des Bundes. 11. Archived from the original on 11 November 2009. This page was last edited on 16 February 2019, at 06:01 (UTC).